There's A Gun For When You Want Someone To STFU | OhGizmo! By David Ponce on 03/05/12 • Leave a comment! No, it’s not like you actually shoot them dead to stop them speaking. What’s the artistry in that? 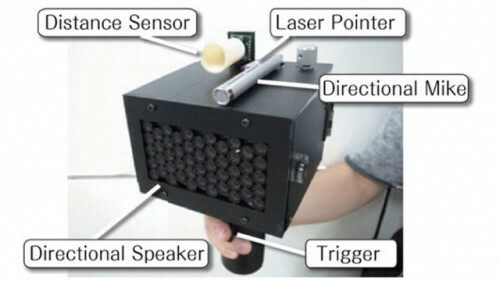 Instead, we’re talking about a speech jamming device, called the SpeechJammer, that is being developed by two Japanese researchers named Kazutaka Kurihara and Koji Tsukada. Yes, it’s a gun-like device whose entire purpose is to make someone stop talking. It works by projecting the target’s own back voice to them, but with a slight delay (around 200 milliseconds), making it almost impossible to carry on speaking. Ever hear an echo when talking on the phone? Yeah, so it’s like that. The device itself consists of a directional mic, a directional speaker, a distance finder and a laser for targeting the speaker’s mouth. Point it at your source of annoyance, pull the trigger and watch them stop speaking, confusion spreading across their faces. The video below does show the gun in action, and some shots look like they might have been done candidly. Or maybe not. Still, it’s interesting to watch. And sadly, the SpeechJammer appears to be nothing but a prototype at the moment.